Some say it was all about the beaver. In 1825, British Hudson’s Bay Company moved its upper Columbia fur-trading business from the Spokane House to Fort Colvile near the Kettle Falls. Prior to Whiteman’s presence, it was estimated 60-400 million beaver had persisted in North American rivers, lakes, and streams. Men trapped, skinned, and stretched millions of hides for various companies and by 1988, the beaver population had shrunk to 6-12 million. Beaver’s hair was shaved from the hide, boiled to shrink, and compressed into felt for hats. Hat’s only the prominent could afford to wear. Thus the need for Fort Colvile, under the watchful eye of HBC’s governing Sir George Simpson who was born in Scotland. Sir Simpson governed HBC in both Canada and the Pacific Northwest, then called Oregon Territory, for forty years. In 1835, Archibald McDonald was then appointed Chief Trader at the Fort and remained for nine years. Come 1844 he left on furlough to the British Isles and retired in 1848. John Work, Irish born, was put in charge of building the fort. Men spent exhausting hours pit-sawing and squaring logs for the fort which was to be built on a sandy ridge 600 yards from the Columbia River. It is the river they’d depend on for their water source. Fifteen-foot tall picket fences and two bastions encircled the courtyard and various buildings: warehouse, store, chief trader’s house or Hall, officer’s quarters, dwelling, and an Indian Hall. Later included were kitchen, blacksmith shop, and other storehouses. Entrances were located in the east and west sides. But it wouldn’t be just about the beaver. Potatoes, hogs, and cattle became large entities as well. Other crops included wheat, maize, and various vegetables. Christian missionaries came and went both Protestant and Catholic. But the one that stayed was Father Pierre-Jean DeSmet. In 1951 and built by Indians, St. Paul’s Mission became a permanent structure that still remains today thanks to rebuilding efforts in 1939. HCB’s main interest was in furs and had no desire for colonization. Its commercial focus would be its biggest mistake. And with the scare of the impending border threats between the British (Canada) and North America, needed repairs to the fort went to the wayside. Thankfully, the Treaty of 1846 settled the boundary dispute peacefully. In 1852, Angus McDonald was appointed Chief Factor. He would be the last one and see Fort Colvile’s closure. 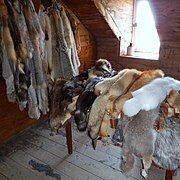 Along with beaver pelt harvesting, there was much trading with the Indians. The HBC was well stocked with ammunition, rifles, spears, hatchets, knives, beaver traps, copper and brass kettles, colored cloth calicoes, beads, rings, thimbles, hawk bells, foodstuffs, and modern quantities of spirits. Most trading was with the Sinixt, or Lake Indians of the Kelly Hill area. 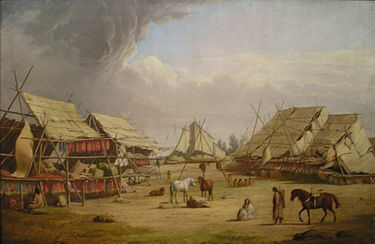 During the time of the salmon runs, tribes from surrounding regions came to fish and trade. Additional tribes including the Colville and Spokane. Chief Gary of the Spokane Tribe visited frequently. 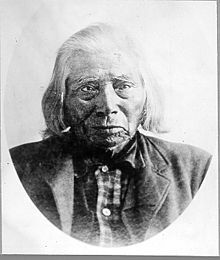 At the tender age of fourteen, Spokane Gary, Slough-Keetcha, and another boy, both sons of prominent chiefs, were sent by HBC with fur traders to be educated at the Red River Settlement’s missionary school in Canada. Garry returned a Christian after five years, fluent in English and French. One time while visiting the Fort, Angus McDonald talked Spokane Gary out of joining other Natives in a land war against Colonel Wright. 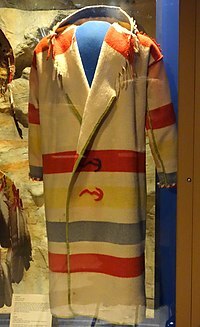 The most sought after item was the trade blanket–Hudson’s Bay Point Blanket. The blanket was not only easier to sew than deer or buffalo hide, but it was also warm, even when wet. Stripes of green, red, yellow, and indigo on a white background were the popular ones. Another favored item was the capotes. From the trade blanket, fur traders made hooded coats which kept them warm in the cold of winter. Thin indigo lines were woven into the blanket to denote its size and weight in such a way they didn’t need to be unfolded and measured. As time went on, beaver pelts, wheat, and gold dust, among a few, held uncertain value. 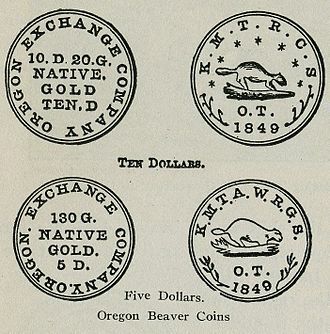 As a solution, Oregon minted gold coins know as Beaver Coins or Beaver Money in 1849. They came in five and ten dollar denominations to fulfill a commercial need of stable currency. By 1842, Fort Colvile had become a close-knit community. Children of HBC’s men grew up together. And as they came into their late teens, married, spanning three generations. A harsh winter came in 1846-47, wiping out most of the 270 horses, leaving three. It was said some cattle froze standing up. When tough times came like that winter, all felt the sting. With the discovery of gold and Indian uprisings, in 1867, the Columbia River ceased to be an important point for fur trading for the HBC. 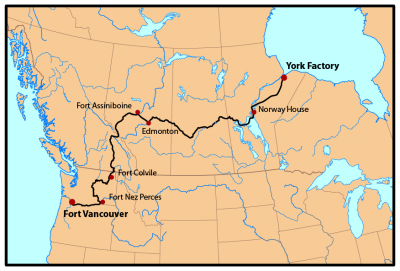 By then another route had been discovered by way of Victoria to move supplies. The fort closed and vacated in 1870. Only the buildings remained. Angus McDonald moved all goods and property to Kamloops, British Columbia on June 8, 1871, and homesteaded the land until 1877. 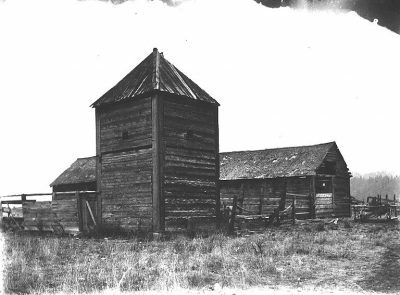 Angus’s son, Donald, then farmed the land until 1907 when he moved to Montana. He retained the land and main house until a fire claimed it all on July 8, 1910. It is still believed the fire was arson. The site of the fort was flooded with 151 miles of backwaters from Grand Coulee Dam, now called Lake Roosevelt after President Franklin D. Roosevelt, in 1941 which happens to be my backyard. Click here for a grand 1930s areal photo of the area prior to the flood. This is much of the reason I included HCB Fort Colvile in the rewriting of my True to Heart Trilogy book one, Change of Heart. 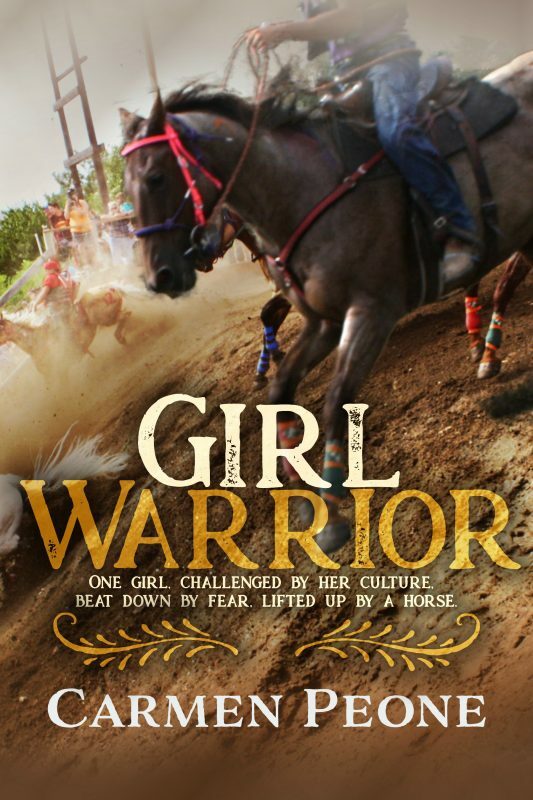 In the coming of age tale, Spupaleena is broken by death, haunted by her past, and lifted up by a healer––a trapper’s wife who lives along the Columbia River. 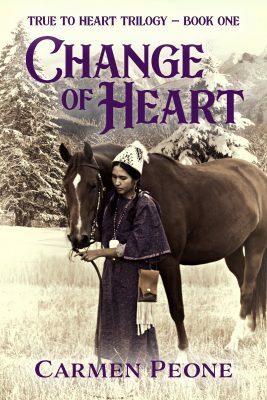 Change of Heart includes a fictional account of Hudson’s Bay Fort Colvile. Order it here. I have come to honor and respect the people and the Colville Tribal heritage and wanted to create a legacy for my sons and grandchildren including their culture and our family’s Christian faith. I believe in adventure and its benefits. Great post. I often wondered about the striped coloring on those blanket coats. Fascinating. I simply cannot imagine surviving in weather so raw and cold. The book sounds as though it has a great deal of research and care in a good story. Looking forward to reading it. Thank you, Barbara. I also cannot imagine surviving especially as a fur trapper, but I suppose the wool coats were heavy and warm as were the buffalo robes. Carmen: I must save this article for future reference. In my Widow’s Landing story collection, I have a story that details another British Fort, but mine is located on Lake Superior at Grand Portage. My heroine learns the fur trading business and then sneaks off to the west to start her own trading post. All the characters in these stories were REAL people. I researched and read and plotted and had fun with each story. Your detail cements my satisfaction that I have recorded this time in frontier history correctly. Judith, your books sound fascinating! I’m glad my article was a source of authentication for you. Hi Carmen, Thanks for this richly fascinating post. I had not known about the beaver money! Thank you, C.M. Isn’t the beaver money a gem? I have even been able to hold a coin during a local re-enactment. They were small coins, but the feel was like stepping back in time. This is so interesting, Carmen. We often see signs of beaver in our wilderness travels, but I have yet to see the critter itself. Thank you, Mary. I’ve seen them a few times, but their sign many. They are magnificent creatures. Jingle in the New Year!